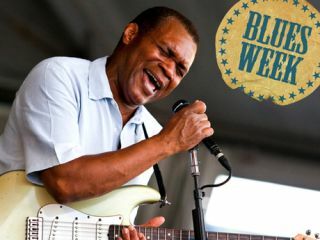 Robert Cray on playing "blues for life"
Blues Week casts a mighty long shadow at MusicRadar. In addition to all of our amazing content covering gear, lists of the greatest players ever (as voted for by you!) and exclusive interviews, we now sit down with the one and only Robert Cray, whom Joe Bonamassa lists as one of his favourite blues guitarists. In 1986, the world took notice of Robert Cray. With his crossover blues-pop hit Smokin' Gun ruling airwaves and its accompanying video receiving heavy rotation on MTV, Cray became the proverbial 20-years-in-the-making-overnight-success story. "And just as quickly, MTV forgot all about me," says Cray, chuckling, without a trace of rancor in his voice. "Even back then, I knew that blues wasn't the bread and butter of MTV. It certainly isn't now. I don't even know what they play anymore. Do they still play music?" In the ensuing years, the five-time Grammy Award winner has toured relentlessly and created an impressive body of recorded work, including Live From Across The Pond, a sizzling two-CD set drawn from a series of shows (opening for Eric Clapton) at London's Royal Albert Hall. "It really doesn't bother me that I'm not the flavor of the moment," says Cray. "I've got the blues for life. I don't even think about topping the charts anymore. I play the music I want, with people I want, to fans that want to hear it. If you ask me, that's not a bad gig." Recently, Cray has released two albums, This Time and the live set Cookin' In Mobile. On both discs, he's working with a new band which isn't really a new band at all: Richard Cousins, Cray's friend and bassist since 1974, returns after a long absence, as does keyboardist Richard Pugh, a cornerstone of the guitarist's group since 1989. At the suggestion of Cousins, drummer Tony Braunagel is the 'new' new addition to the Robert Cray Band. "It was time to shake things up," says Cray. "Everything was getting a little too comfortable. I like things to be on the edge, from calling out the songs to just doing what I want to do on the bandstand." Let's talk about your musical evolution. You're a blues artist, but you started playing the guitar after seeing The Beatles. "Well, I got a guitar after seeing The Beatles on TV. They were a big deal, of course, and they got a lot of people picking up instruments and thinking about forming bands and stuff. But really, they were just a part of all the music I grew up listening to. "I was lucky: my parents had a great record collection. Sarah Vaughan, Ray Charles, Sam Cooke - everything from pop singers to blues, they seemed to have it all. I was listening to those records before I saw The Beatles. But yeah, The Beatles did get all the kids hyped up on buying guitars, and I was one of them. "Once I got that guitar, I wanted to learn to play everything I could. Some of my buddies were listening to Buddy Guy and Magic Sam and BB King and Muddy Waters, and those records really hit me. I loved The Beatles, but I guess I was looking for something different. And then when I saw Jimi Hendrix live, well, that had a major impact on me." "Yeah, in Seattle. Amazing. He was different from everybody else, and his music was deep. So between the records my friends had turned me on to and listening to Hendrix, I really started getting into the blues. It was cool." A lot of guitarists in the '60s did their history backwards. They listened to Eric Clapton and Hendrix and found out who influenced them - and then they checked out those players. But it seems as though you already knew the masters. "I did, but I still listened to the contemporaries of the time, and yes, I did pay attention to who they had listened to. Sure. I heard Fleetwood Mac with Peter Green, and I was listening to Clapton. That was a funny but exciting time, how the British players were giving us the blues, and yet the blues existed in our own backyard. I was pretty aware of all that at the time - again, because of what my parents were listening to and the records my friends had. By the time I was a teenager, I was pretty well-rounded in my tastes and influences. "We even had the good fortune of having Albert Collins play our senior class prom. We voted on who we wanted to come play, and lo and behold, he actually did. I met him and he said to me, 'Young man, you play guitar?' I told him I did and he said, 'Keep it up!'" Wow, you're lucky. Some lame local band played at my prom. [laughs] "Those are the breaks." At what point did you say to yourself, "Playing the guitar is what I must do with my life"? "Well, see, there wasn't any time when I said that; I just never quit. My friends and I were playing all the time. Even if I worked at the car wash, when I got home the first thing I did was pick up the guitar. There was never any choice in the matter for me - it was already predetermined. "Then I ran into Richard Cousins, my bass player, in 1969, and we played together in a few bands. In 1974, we moved to Eugene, Oregon and formed The Robert Cray Band. That probably sealed the deal for me. After that, I was in it for good." Were your parents nervous? It's one thing for your son to love playing the guitar. It's quite another for him to try to make it his life's work. "I'm sure they were scared. But they had confidence, and they trusted me." At what point did you start playing Stratocasters? You're so identified with the model, and you have a line of Fender Robert Cray signature Strats, as well. "I started playing Strats after seeing Phil Guy in 1979. He had the most awesome sound I ever heard. He was playing through some kind of amp with reverb, and it was so…crystalline. It really blew me away. Before that, I was a Gibson guy. I had an ES-345 stereo and an SG Standard." You have a very recognizable sound; it's both stinging and sweet. But one thing I want to ask you about is your vibrato, which all comes from your fingers. "Yeah, from my left hand. It just kind of happened, but I guess the biggest influence on me vibrato-wise was BB. When he played, he'd put the 'stinger' on a note - that's what we called it. [laughs] It was great! I loved listening to him. To get that sting, you had to hold that note and let it ring for all it's worth." Unlike a lot of players, however, you put vibrato on multiple strings. How did that come about? "It just came naturally to me. But you know, listening to the sound of the old Magnatone amplifiers really affected me. They seemed to put their own kind of wiggly vibrato on the sound. I heard that on some old Wilson Pickett records. However, when you don't have one of those amps, what are you to do? Well, you start wiggling your hand - that's how you can get that sound. So it was really those old amps that influenced me to start introducing a more complex form of finger vibrato." Let me ask you about your singing. Unlike a lot of blues artists who sing in a very gruff style, you have a very smooth sound to your voice. Where did this come from? "I guess it came from who I liked listening to. I like the gruff singers, too, guys like Howlin' Wolf and other singers. But my mother had records by Sam Cooke and Bobby Bland, and I grew up admiring them. Also, there was Al Green and Otis Redding. So when I started singing, I found that my voice was more of a tenor, it was more like those guys. You know, you can't fake your singing voice; it is what it is, you know? I just did what came naturally. We talked about your early influences, but who are some newer players who you like? Anybody current? "I haven't really paid super-close attention to the new guys. I travel so much and I'm so busy, so when I get off the road, I tend to stay quiet. [laughs] But I did catch WC Clarke and I think he's awesome. He's older beyond his years. He's got his head on right, and he's a cool kid." Being that you're a Strat player, what is your ideal amp combination? "I play through Matchless amps. I use a Clubman 35 head and 4 x 10 cabinets. I have two setups of those. I also play through a Fender Vibro-King. I like the Vibro-King because it has a meatier sound than the Matchless, but I have the Matchless amp loaded with some high plate power tubes, so they give me a very bright sound. The combination is great. I can get a gritty tone when I want, and when I want it to be sweet and clean, I can get that, too." At this point in your career, do you have any kind of practice routine, or are you one of those guys who just picks up the guitar whenever? "I kind of fall in the middle. [laughs] Like I said, when I'm home, I'm home. Guitars are sitting around. I walk by them, but I don't pick them up unless I want to. I don't force myself to play or practice." That said, are there elements of your playing you still want to improve upon? "That's the fun part, the getting there. You never really get there all the way. What's even more fun is when you're challenged on stage in front of an audience. Once a song starts, if you can take an audience with you, that's the adventure. To me, that's what it's all about. It's about being in the moment. Just go on stage, don't have a setlist and take your clothes off, you know? And don't be afraid to fail." You shared the stage with Stevie Ray Vaughan the night before his death. What are your musical collections of him? "But it just so happened that, after the festival, we were booked to do some shows together, and we became friends. Over the years, we did a lot of shows together. "I watched him develop, saw him get his record deal with CBS. And then we got our deal and The Fabulous Thunderbirds got signed. It seemed that the blues thing was really taking off, you know? The Blasters, Los Lobos - suddenly all these bands were on MTV. It was good. "When we did the show at Alpine Valley - it was Eric Clapton's show - we all got together, all the Strat players, and we did a photo shoot for Fender. We hadn't seen each other for a while. Jimmie and Stevie had just finished the Family Style album. It was a great time. You don't always see each other when you're on tour, so it was cool to reconnect. We had a nice time. We all came out and did that last song…it was great. That's how I want to remember Stevie."